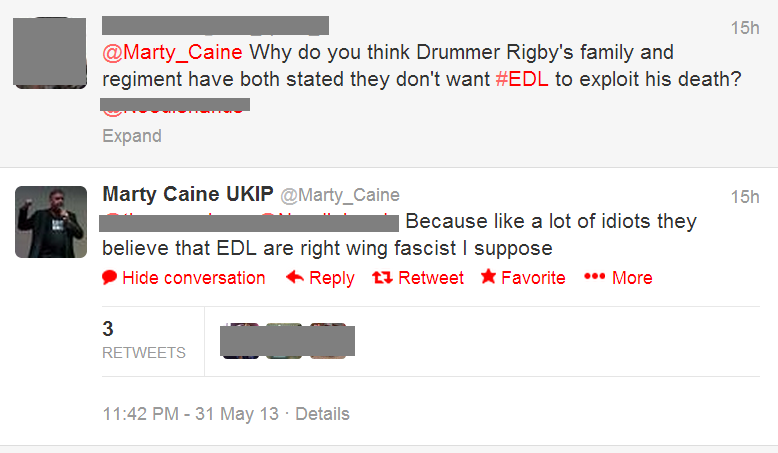 As if it isn’t bad enough defending the EDL – it seems UKIP activist Marty Caine needed to dig himself a hole even deeper by branding Drummer Lee Rigby’s family “idiots” after their moving statement pleading for calm. Just how low do UKIP members have to go before the British public realise they stand for nothing in the least bit British and UKIP is in fact just another extremist minority party like the EDL and the BNP which should be confined to the political fringes where all the other crackpot parties in the UK dwell. This entry was posted on Sunday, June 2nd, 2013 at 5:12 pm	and posted in Uncategorized. You can follow any responses to this entry through the RSS 2.0 feed.